Detailed and compiled info for the elf. Added several details & 1 drawback to the dwarf. Added: elf, half-elf, half-giant, human, mul (no 5E D&D stats yet). All races added still need details added, but the mechanics are there. These are the races that are found in numbers in the Tyr Region of Athas. They are the races that make up almost all of the numbers of the city states. For races of the wastes or surrounding lads, see the Minor Races page. Dwarves once ruled great mountain kingdoms, until the wars of the Red Age destroyed their holdings. They have fallen far from their ancient glory. (4E D&D Dark Sun Creature Catalog p40). Despite the current absence of dwarven cities or strongholds, dwarves have a rich cultural history passed down from generation to generation in great sagas and secret traditions. Long ago, dwarven cities were the marvel of the world, and the dwarves keep the tales of their past glories and bitter defeats alive across the centuries. (4E D&D Dark Sun Campaign Setting p25). Although the dwarves of the present-day Athas carve no great citadels and retain few of their ancient holdings, your people remain the most talented stoneworkers and engineers in the world. Dwarf-made wells, cisterns, and canals are marvels of design, and dwarven metalwork - rare though it might be - is the finest to be found. (4E D&D Dark Sun Campaign Setting p25). A dwarf's chief love in life is toil. They are never happier than when they have a purpose and a cause to strive towards. An individual dwarf is working towards achieving a goal at any time in its life. They take the long term approach to these goals and many can be considered life-goals. There is a great sense of fulfillment when a dwarf achieves a life goal, for to fail has very dire consequences. A dwarf that never finishes a focus must wander the wastes as a banshee, haunting their unfinished works! Whilst most Athasians have a dislike of arcane magic, dwarves take their aversion to a higher level. They are so adverse to arcane magic in fact that they have developed a resistance against it and have trouble channeling arcane energies through their bodies and minds. The dwarves of Athas have the stature of their kindred in other worlds - short, sturdy, and thickly muscled. Most dwarves have deep tans from lives spent toiling in the hot sun, with wide, callused hands and feet. They usually have little or no hair; the flowing beards that are the pride of male dwarves on other worlds are never seen on the Athasian variety. (4E D&D Dark Sun Campaign Setting p25). 4' +2d4 170 lb. x (4d6) lb. 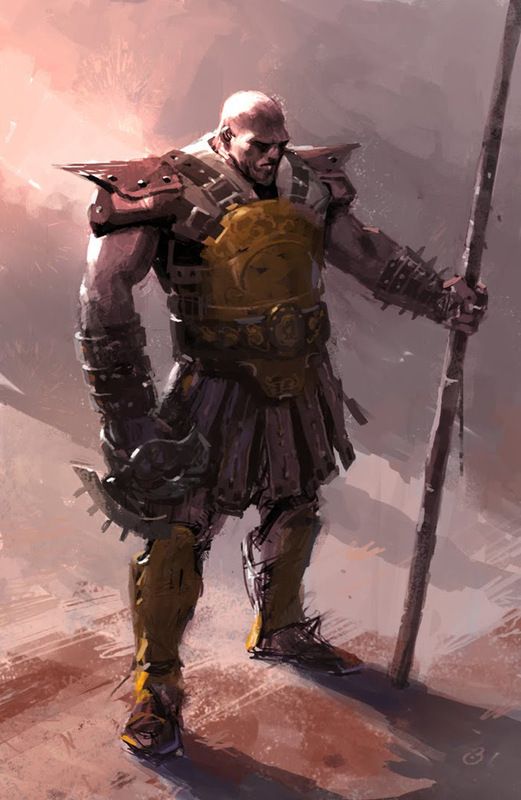 Athasian dwarves tend to be more muscular and stockier than standard dwarves. Dwarves are found in the company of humans, muls, elves (though they may not trust them) and other city-dwellers. They are skilled beast-handlers and train war beasts such as jhakars, drakes, cilopses and giant beetles. (4E D&D Dark Sun Creature Catalog p40). Dwarves are typically lawful. Many are also neutral, though there are more good dwarves than there are evil. Dwarves are known for their stoicism and single-mindedness. They fix their minds on a task at hand, whether it is a challenging feat of engineering, and intricate work of craft, a struggle for survival, or a quest for revenge. It's just not in their nature to abandon a task or leave work half done; dwarves set aside the object of their focus only after much grumbling and coercion. (4E D&D Dark Sun Campaign Setting p25). As a dwarf you need to decide what is the object of your focus. it must be something that will take at least a week to complete. When you complete a goal, you choose another. There is very little room for compromise in the mind of a dwarf. Anyone opposed to your focus will be at odds with you. Those that support your focus are sensible and dependable companions. Expert/artisan (engineer, builder, mason, smith, brewer, farmer, miner); guard/soldier; earth priest; oathsworn; gladiator; noble; site guardian; wilder; sun priest; labourer/slave; beast handler; reeve. Starting languages: Dwarven and Common. All but dwarven wizards are illiterate. Most dwarves view their illiteracy as a badge of honor, claiming dwarves need no magic or writing to survive the brutal world of Athas. Names - as standard dwarves. Dwarves have no lands of their own and are found living among other folk (particularly humans). They reside both in cities and in desert settlements. They tend to have a home base, rather than wander. Dwarves favour the earth and fire spirits. Dwarven Combat Training. If using weapon groups, replace the weapon proficiencies listed with: Axes & Picks (Simple + battleaxe) and Hammers & Maces (Simple + warhammer). Wild Talent. You know one random cantrip from a spell list of your choice. You do not need any components to cast this spell and Charisma is your spellcasting ability for it. All races of the Dark Sun setting typically have latent psionic ability. Dwarven Toughness. Your hit point maximum increases by 1, and it increases by 1 every time you gain a level. Use this feature for desert dwarves from standard settings. Dark Sun dwarves are free to choose this too if they do not wish to be Wild Talents. (See our Drawbacks Page to see how these house rules work). Clumsy (Minor) OR Stubborn (Minor). With their sturdy build, dwarves are not as dextrous as others and many dwarves have a stubborn nature. Aversion - Arcane Magic (Minor). The -2 penalty applies to your spell attack rolls and the DC to save against your spells is reduced by 2. These penalties do not apply to spells cast as from your Wld Talent or spells selected from the cleric, druid, paladin, or ranger lists. Honorable (Minor). Desert dwarves have a lot of racial pride to uphold. Obsession (Minor). This obsession is your focus. When you have a chance to be toiling on your focus it is hard to get you to focus on anything else. Primitive (Minor). This is typical for the dwarves of Dark Sun, where metal is very rare. Illiterate (Minor). The secret of reading and writing is long lost; none can decipher the ancient runes of dwarven writing. Only dwarven wizards have a basic understanding of writing. Bonus Proficiencies. 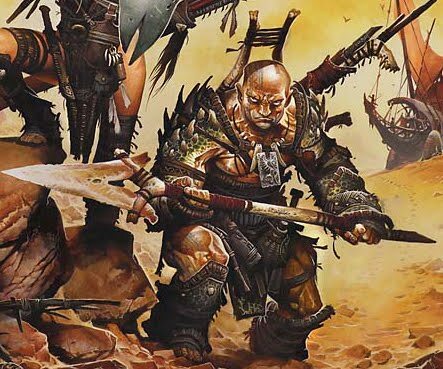 For each minor drawback assigned to a desert dwarf, you select one of the following: Athletics, Endurance, History, Nature, Survival, Brawling (Simple), Clubs & Staffs (Simple), Spears (Simple), or any one tool kit or vehicle group that is related to your focus. Ability that starts at d8: Vigor. Wild Card dwarves also begin with a d8 in one other ability from the following choices: Athletics or Will. Double the Advancement cost at character creation to raise: Agility, Deception and Persuasion or any of their Specialties at character creation. (This does not affect Advances after character creation). Languages: Auto start with d8 in Common & Dwarven. Other languages must be purchased as separate Abilities. Talent Tree Access: You gain free access to Anti-Magic, Earth, Endurance and the Tough Talent Trees. (Language): Can improve Dwarven or Common. Arcane Resistance: When resisting any arcane power, a dwarf gains +2 to the roll and their Toughness is considered 2 points higher. Low Light Vision: Ignore attack penalties for Dim and Dark lighting. Dwarves have traditionally lived below ground. Poison Resistance: Advantage on Vigor (Resilience) rolls vs poisons. Sturdy: Athletics (Run) is not affected by Encumbrance. Dwarves can also use Vigor (Durability) to resist forced movement or being knocked prone. (In place of Agility or Strength for example). They may even initiate a check as a reaction, when no check is usually allowed. Distance moved is reduced by 1" for every success and raise. Arcane Aversion: Athasan dwarves have no connection to arcane magic. If they find themselves able to cast arcane magic, all rolls are made with Disadvantage. Honor-Bound Hindrance: (Major) -2 to Deception rolls. Dwarves are typically lawful; their word is true and they live by a code of honor and ethics. Stubborn Hindrance: Dwarves have a hard time doing things differently. Athasan dwarves always have at least one focus (a task that will take at least a week) and it is very hard to turn them away from this. Stunted: -1 Pace. Dwarves' legs are sturdy, but short nonetheless. 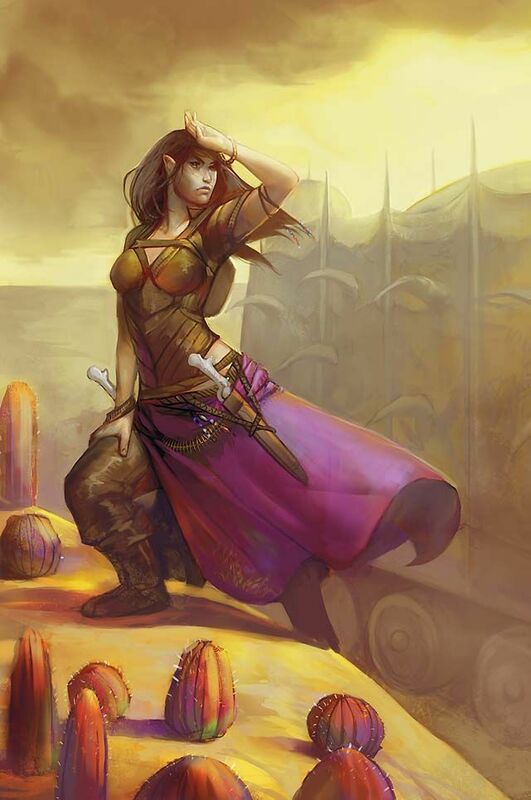 Elves are tall, long-legged desert rovers whose tribes wander the face of Athas. (4E D&D Dark Sun Campaign Setting p26). Tribes of elves roam the deserts of Athas and bring their wares to the scattered settlements. Though they are considered shifty and untrustworthy, the elves bring unique items to their travelling markets that ensure plenty of business. (4E D&D Dark Sun Creature Catalog p44). Elven trade is the lifeblood of the Tablelands. Stories of elves describe swindlers in elven bazaars and wandering bands of raiders that strip caravans of goods. Entire elf tribes have disappeared from city-states after a single member ran afoul of templars. Though considered dangerous by most other races, the elven markets of the various city-states are an important source of contraband, particularly that of the magical variety. However, most people know to be cautious when deal with elves, since being cheated in a deal is the least of what they have been known to do. Most elves simply seek to get the most out of every bargain, and the more cutthroat members of a tribe might use that motivation as an excuse to murder and steal. (4E D&D Dark Sun Creature Catalog p44). Each of the great city-states hosts a branch of the Elven Market - a never-ending bazaar where elves (and others who deal in goods of dubious origin) sell their wares. Many elven goods are cheap baubles of little worth or were stolen from their rightful owners. Still, elves have a knack for being in the right place at the right time to peddle their wares, and even the most officious templar appreciates the selection of goods in the elven market. (4E D&D Dark Sun Campaign Setting p26). Elves run swiftly and with great endurance. Tribes can manage forty miles a day or more, day in and day out. Elves consider it shameful to ride an animal such as a crodlu or kank, and one does so only if ill or gravely wounded. Normally, such mounts are used as beasts of burden to carry the tribe's goods and tents. If a sorcerer-king sends his soldiers to punish an elven tribe for a brazen act of theft or lawlessness, he might find that not even kank-mounted cavalry can catch a tribe that has a mind to be somewhere else. (4E D&D Dark Sun Campaign Setting p26). An Athasian elf stands between 6 1/2 to 7 1/2 feet tall. They are slender, lean and generally in terrific physical condition. Their features are deeply etched into their weather-toughened faces, and their skin made rugged by the windblown sands and baking sun of the wilderness. Elves typically dress to survive in the desert environment. Even when at an oasis or in the cities, elves tend to prefer their native garb, designed to wrap the wearer against the brutality of the elements. (2E D&D Dark Sun Boxed Set: Rules Book p6). Age - as normal elves. 6' +2d8 130 lb. x (3d6) lb. Elves might join others in a raiding band, but they have few allies in general. Even other elf tribes are competition at best - there is no racial unity. Only those that have passed tests of trust can be considered allies to an elf tribe. This applies to individual elves too, who will often set up tests of trust for any non-elf companions. If playing an elf you should fabricate these tests for your companions to earn your trust. Elves favour the chaotic alignment with no particular leaning on the good-evil axis. Most Athasians consider elves lazy and deceitful. It's true that many elves dislike hard work and prefer to live in the moment, avoiding unpleasant tasks and drudgery. They have little regard for anyone who is not a member of their tribe. Elves happily take advantage of, steal from, lie to, or misdirect outsiders, not out of malice so much as a desire to separate the gullible from their items of value. When it's important to maintain a valuable trading relationship, elves honor their word and barter in good faith. But the moment they perceive an opportunity that is too good to pass up, they abandon their previous deals. (4E D&D Dark Sun Campaign Setting p26). Elves value their freedom above all else. Being adaptable and self-sufficient is also important. Elves do whatever they need to do to survive, be that trading, raiding, herding or stealing. Scout/rover; herder; merchant/trader/peddler; caravan guard; archer/sniper; ranger/dune strider; Athasian minstrel (rogue/scoundrel/charlatan/swindler); entertainer/bard; thief; raider; sorcerer; wizard (likely Veiled Alliance member); wilder; nomad; slave/ex-slave. Starting Languages: Elven & Common. Elves frequently learn the languages of the races they trade with, both in the cites and in the wastes. Elves are nomads, so no place is called home for long. They can be found travelling the paths of the wilderness or in the cities' bazaars. Elves roam over all of the Tablelands. Elves rarely take to religion, though many tribes have nature priests that honor the spirits of wind and earth. Fire spirits may also be appeased to keep the suns rays at bay and others may become full druids and tend to the dying flora of Athas. Elf Weapon Training. You have proficiency with the longsword, shortsword, shortbow and longbow. If using the weapon group proficiencies house rule, this feature grants proficiency with: Bows (Simple + Martial), Long Blades (Simple), Short Blades (Simple + Martial). Desert Runner. Desert elf tribes move across the wastes at remarkable speeds. A desert elf can double all overland movement in desert, hills or plains terrain. Furthermore they can run for days on end. Replaces the word hour with day for Forced March, chapter 8 Player's Handbook. Wild Talent. You know one random cantrip from a spell list of your choice. You do not need any components to cast this spell and Charisma is your spellcasting ability for it. Elves of the Dark Sun setting typically have latent psionic ability. Fleet of Foot. Your base walking speed increases to 35 feet. Use this feature for desert elves from standard settings. Dark Sun elves are free to choose this too if they do not wish to be Wild Talents. Frail (Minor) OR Unwise (Minor). Although good runners, desert elves have slight builds and their intellect is not tempered by common sense. Outsider (Minor). Other races have to deal with the elves for trade, but that does not mean they trust them. This applies to anyone outside your tribe or people have passed your 'tests of trust'. Loyal (Minor). Applies only to other elves of your tribe and individuals that have passed your 'tests of trust'. Primitive (Minor). This is typical for the elves of Dark Sun, where metal is very rare. Bonus Proficiencies. For each minor drawback assigned to a desert elf, you select one of the following: Deception, Endurance, Nature, Sleight of Hand, Stealth, Survival, Spears (Simple), herbalism kit, or a musical instrument (one musical instrument group for our grouped proficiency house rules). Ability that starts at d8: Agility. Wild Card wood elves also begin with a d8 in one other ability from the following choices: Deception, Marksmanship, Perform, Perception, Stealth or Survival. Double the Advancement cost at character creation to raise: Status, Technical and Will or any of their Specialties at character creation. (This does not affect Advances after character creation). Languages: Auto start with d8 in Elven & Common. Other languages must be purchased as separate Abilities. Talent Tree Access: You gain free access to two of the following Talent Trees: Skirmisher Fighting Style, Unfettered Fighting Style, Charm/Face, Scoundrel, Wilderness. (Language): Any, including improving Elven. Attractive: Start with the Attractive Edge. Elven features are appealing to the eye. Elven Senses: Advantage on Perception (Notice) rolls. Fey Origin: Considered fey creatures for the purpose of origin, but Atahasian elves have no connection to the Feywild (and probably don't know of its existence). Desert-Born: Treat all desert terrain as one category lower when using the Overland pace system. Elves are used to moving through the wastes quickly. Free Spirit: Immune to magical sleep. Low Light Vision: Ignore attack penalties for Dim and Dark lighting. Eyes amplify like a cat’s. 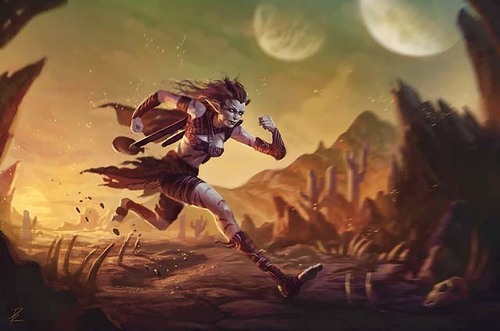 Runner: Advantage on all Vigor (Stamina) checks to resist fatigue from forced marches and extended running. Elves are known to run everywhere in the wastes and all members of the tribe are expected to keep up. Trance: Gain the benefits of an extended rest from entering a reverie state for 4 hours. Whilst in a trance you remain aware of your surroundings and make Perception (Notice) rolls without penalty. Brash Hindrance: (Minor). -1 to Will rolls. Elves act impulsively and live in the moment. Their sharp wit is not tempered with commonsense. Loyal Hindrance: (Minor) To tribe and anyone that has passed several 'tests of trust'. You do all that you can to help your tribe and will not betray them or abandon them to be taken advantage of or hurt by others. (Those that simply fall behind when on the move is part of the natural order). Mount Aversion: Disadvantage on all Coercion and Persuasion checks made with elves that are aware that you made use of a mount. Elves consider it dishonourable to use use beasts of burden as mounts. They are for carrying material goods, and an elf is expected to run. (Exceptions may be made in the case of the severely wounded). Outsider Hindrance: -2 Persuasion when dealing with anyone outside the elf's tribe (even other elves), except those that have passed the 'tests of trust'. Elves have little regard for anyone not in their tribe (or who have not passed their 'tests of trust). Elves happily take advantage of, steal from, lie to, or misdirect others, not out of malice, so much as a desire to separate the gullible from their items of value. Likewise, other people do not trust elves. Slender: -1 Toughness and to Athletics die for the purpose of determining encumbrance. Suspicious: Elves do not trust anyone outside their tribe, unless they pass their 'tests of trust'. Tests include subtle set-ups like leaving gear out to see if it is stolen, or placing yourself in a dangerous situation and seeing whether your companion comes to your aid. When several minor or one major 'tests of trust' have been passed, an elf considers that companion as a loyal friend (see Loyal Hindrance). Information for roleplaying this race in Dark Sun: D&D 4E Dark Sun Campaign Setting p28; D&D 2E Dark Sun Boxed Set Rules Book p7. Multi-talented/Self-reliant; Loner/Exile; Ranger/Scout; Beastmaster; Herder; Hunter; Explorer; Merchant guard; Charlatan; Bard; Assassin; Mercenary; Psion; Wilder; Dune trader; Gladiator; Primal guardian; Wizard (and likely Veiled Alliance member); Nomad. Half-elves rarely find a home of their own, forever wandering from situation to situation or settlement to settlement, without a people, land, or village to call home. There are said to be some isolated half-elf communities in the deserts that act as havens for these lost people. Outsider (Minor). Choose a particular society/group that raised you (typically an elven tribe or human settlement). The penalties of this feat do not apply when interacting with members of that group. Bonus Proficiencies. For each minor drawback assigned to a half-elf, you select any one skill, weapon group or tool sets/kits. (If the Short Blades weapon group is chosen, you gain Simple + Martial. For all other weapon groups it is Simple only). Ability that starts at d8: Agility. Wild Card half-elves also begin with a d8 in one other ability from the following choices: Animal Handling, Deception, Perception, Perform, Persuasion, Stealth, Survival. Double the Advancement cost at character creation to raise: Status, Warfare or any of their Specialties at character creation. (This does not affect Advances after character creation). Languages: Auto start with d8 in Common & Elven. Other languages must be purchased as separate Abilities. Talent Tree Access: You gain free access to the Adaptable Talent Tree. Half-Elves typically do not have their own list of Specialties to chose from (see below). Elven Heritage: Gain 1 Racial Trait and 3 Advances to spend on the Specialties listed under the Elf entry. Fey Origin: Considered fey creatures for the purpose of origin, but they feel no affinity to fey creatures. Human Heritage: Gain 2 Advances to spend freely. Low Light Vision: Ignore attack penalties for Dim and Dark lighting. A half-elf's eyes amplify like a cat’s. Wayward: -2 to Persuasion rolls regarding elves and humans. The half-elves of Athas do not fit into either culture. Elves are especially intolerant, viewing half-elves as inferior, whilst amongst humans, there is always a level of distrust with anyone bearing elven heritage. However, most half-elves seek acceptance by both races and try to prove their worthiness in the presence of either race. Information for roleplaying this race in Dark Sun: D&D 4E Dark Sun Campaign Setting p27; D&D 2E Dark Sun Boxed Set Rules Book p9. The are also written up in the D&D 3E Expanded Psionics Handbook p12. 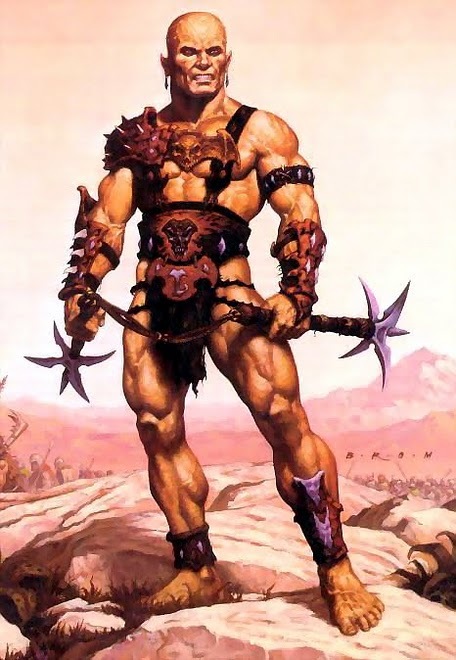 Soldier/Guard; Labourer; Servant of the State/Slave; Mercenary; Urban thug; Ranger/Scout; Hunter; Raider; Wilder; Gladiator; Primal guardian; Mountain barbarian; Battlemind. Half-giants were created by the sorcerer-kings long ago, and many of them still serve these masters. Most half-giants are found in the cities where sorcerer-kings have hundreds of half-giants in their service. Some half-giants serve nobles and free ones often become thugs if they do not escape to the wastes. Half-giants are more common the closer one gets to the Sea of Silt. In the wild they usually take to the mountains and often form tribes of their own kind. Ability Score Increase. Your Strength score increases by 2 and your Constitution score increases by 1. Darkvision. You can see in dim light within 60 feet of you as if it were bright light, and in darkness as if it were dim light. You can't discern colour in darkness, only shades of grey. Your sight is a magical feature from the first bred half-giants. Desert Born. You're naturally adapted to extreme heat, as described in chapter 5 of the Dungeon Master's Guide. You also ignore movement penalties for sandy or rocky terrain. Powerful Build. You count as one size larger when determining your carrying capacity and the weight you can push, drag or lift. You are also counted as one size larger for opposed rolls where your bulk would be beneficial, such as resisting forced movement and being swallowed whole. Furthermore, when wielding a versatile weapon, you deal the damage listed for using two-handed. Psionic Stomp. You can stamp your foot and send a psionic ripple through the earth. You can cast earth tremor as a 1st level spell (from the 5E D&D Xanathar's Guide to Everything or Elemental Evil Player's Guide) without needing a material component. After you use this trait, you can't use it again until you finish a short or long rest. Charisma is your spellcasting ability for this spell. (If you do not wish to play a psionic half-giant, replace this with Stone's Endurance from the goliath race). Giant Toughness. Your hit point maximum increases by 1, and it increases by 1 every time you gain a level. Use this feature for half-giants from standard settings. Dark Sun half-giants are free to choose this too if they do not wish to be Wild Talents. Dullard (Minor) OR Unwise (Minor). Although magically created, many half-giants inherit the weaker minds of their giant brethren. Lumbering (Minor). Your bulk means you are not as agile or nimble as other races. Primitive (Minor). This is typical for the half-giants of Dark Sun, where metal is very rare. Bonus Proficiencies. For each minor drawback assigned to a half-giant, you select one of the following: Athletics, Endurance, Survival, or Clubs & Staffs (Simple + Martial). Ability that starts at d8: Athletics. Wild Card half-giants also begin with a d8 in one other ability from the following choices: Survivial or Vigor. Double the Advancement cost at character creation to raise: Agility, Deception, Knowledge, Smarts, Technical, Vehicle Operation, Will or any of their Specialties at character creation. (This does not affect Advances after character creation). Languages: Auto start with d8 in Common and Giant. Other languages must be purchased as separate Abilities. Talent Tree Access: You gain free access to the Endurance and Tough Talent Trees, as well as one of the following: Brawling, Crushing & Cleaving, Fury, > > > > > Adaptable OR Wilderness . (Expertise): Any one, usually Labourer-based. (Language): Dwarven. Can also improve Common or Giant. Size +2: Size bonus is added to Toughness and to Athletics die for determining Encumbrance limits. Goliaths are bulky and stand over 7 feet tall. Strong: Strength specialty die may advance above Athletics die. (The higher of the two is used for melee damage rolls). Curious Hindrance: Half-giants are natural explorers, and have little fear of the unknown. Lacking Identity: Half-giants don't have a culture of their own and typically mimic those around them. Many are also very friendly and eager to please others, so this also leads them to adopt the ways of other races. Mood Swings: A half-giant character selects a suite (usually 3-5) of personality-based Hindrances. One of these is in play at a time. This Hindrance can change daily (or following an event would change a half-giant's mood). Half-giant moods are mercurial and their demeanour can change quickly. Information for roleplaying this race in Dark Sun: D&D 4E Dark Sun Campaign Setting p29; D&D 2E Dark Sun Boxed Set Rules Book p13. Noble; Slave; Artisan/Expert; Merchant/trader; Escaped slave; Bureaucrat/Templar; Explorer/ranger; Scout; Guard/Soldier; Wizard (and likely Veiled Alliance member); Street thug/thief; Guild thief; Slaver; Landowner; Gladiator; Psion; Wilder; Athasian minstrel; Primal guardian; Nomad; Hermit; Sorcerer. Resourceful and hardy, humans are the most numerous and widespread race in the Tyr region. They can be found throughout the wastes and make up most of the population of the cities. Their appearance varies slightly based upon their home city-state. As human in the 5e D&D Player's Handbook chapter 2. Ability that starts at d8: Any one ability. Wild Card humans also begin with a d8 in one other ability of their choice. Language: Humans start with a d8 in Common. Other languages have to be purchased separately (as if a new Ability). Extra Advances: Start with +5 Advances to spend freely. Information for roleplaying this race in Dark Sun: D&D 4E Dark Sun Campaign Setting p20; D&D 2E Dark Sun Boxed Set Rules Book p14. Battle slave; Gladiator; Freed slave; Escaped slave; Slave laborer; Soldier/Guard; Wilderness warrior; Street thug; Battlemind; Fighter; Raider; Rebellion leader; Wilder. Muls are typically found in numbers in the cities and wherever slaves are kept. Of course, many individuals have gained their freedom and taken to the wilderness, but there are no know 'mul settlements'. Ability that starts at d8: Vigor. 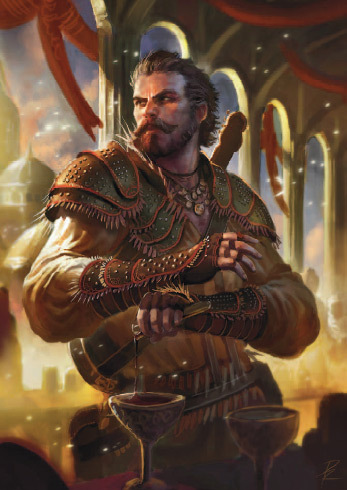 Wild Card muls also begin with a d8 in one other ability from the following choices: Agility, Athletics, Fighting, or Will. Double the Advancement cost at character creation to raise: Deception, Persuasion, Status or Technical or any of their Specialties at character creation. (This does not affect Advances after character creation). Talent Tree Access: You gain free access to Endurance, Tough and two of the following TTs: Brawling, Crushing & Cleaving, Fury, Skirmisher, Slayer, Two-Weapon, Unfettered, Weapon Master - Melee (fighting styles), Adaptable, Earth. (Language): Any tongue they may have had to learn. Can also improve Common or Dwarven. Bred For Battle: If dealt a Club on the first round of combat you gain Advantage on any Fighting and Athletics (Run) rolls you make in the first round. Determined: When pitted against a single opponent in any endeavour, a mul gains a +1 to all opposed rolls vs that opponent. This does not include rolls made to resist a caster's power. Tireless: Advantage on Vigor (Stamina) rolls to resist Fatigue due to environmental effects, including a lack of sleep. Any cumulative penalties for lack of sleep are also halved. Outsider Hindrance: -2 to Persuasion rolls when dealing with non-muls. It does not apply to Persuasion (Convince) though. Being so self-focused and often blunt and uncaring, tends to make it hard for them to get along with others. Slave: Muls are typically slaves in the Dark Sun Setting and thus begin with no dice in Status. A player may choose to play a free mul and can start with a d4 in Status. Increases from here are payed for normally, (not forgetting it costs double for mul characters to raise Status) and there are no bonus Advances for starting with a reduced Status.